Pursuing industry awards can help spotlight success, boost team morale, and build your professional brand. 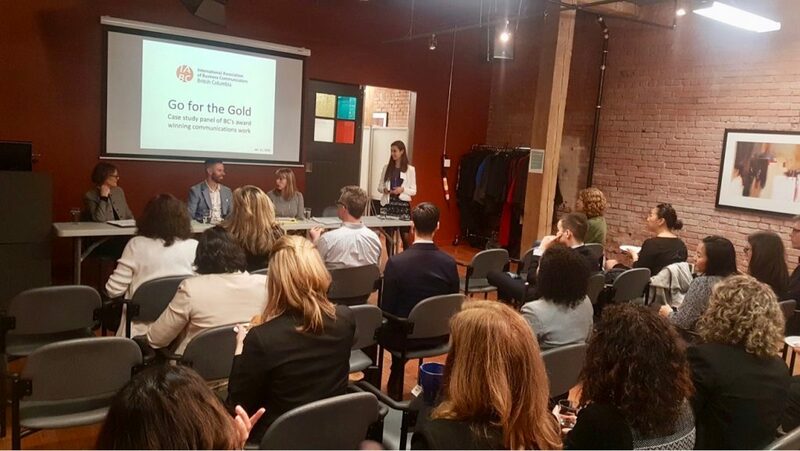 At this event, three international Gold Quill award winners walked the audience through examples of their successful submissions. Developing a standout entry starts in the early strategic development stage of a campaign, so the panelists equipped attendees with the right questions to ask and metrics to track from day one. Laurie Dawkins, Director, Corporate Communication with Vancouver Coastal Health, shared a video to introduce an award-winning campaign celebrating Vancouver Coastal Health’s 15th year in operation. Loosely based on the popular Humans of New York photoblog and book, the video acts as a superb storytelling medium for the employee experience. Laurie emphasized the importance well-researched target audience segmentation – instead of “all employees” as a target, show you know your audience and how to reach them based on specific characteristics and demographics. Adam Brayford, Assistant Director, Digital Strategy, Simon Fraser University, imparted his experience submitting SFU’s 50th anniversary campaign for a Gold Quill. He highlighted the importance of connecting a communications campaign back to both the organization’s strategic goals and to communications opportunities in the wider environment. Adam also recommended selecting only one component of a large initiative or campaign, to keep the scope manageable for a Gold Quill submission. Brenda Lea Brown, Senior Project Manager, Partnerships & Marketing, BC Securities Commission, shared her advice for a successful Gold Quill Award submission in the context of BCSC’s award-winning Be Fraud Aware: The 2 Minute Musical video. Submitting a single campaign in multiple categories is one way to increase the chances of a win, she noted, as is entering tactical activities and the creation of products into the “Communications Skills” Gold Quill category. Each of the presenters emphasized that a flashy campaign alone won’t win an award – submissions require intentional SMART goals, established ahead of time. Finally, the audience benefitted from a lively discussion during the question and answer period. Learn more about submitting your work on the Gold Quill Award website.